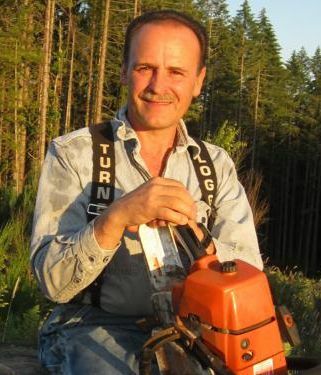 HILLSBORO, Ore. (CNS) — Early Saturday mornings when Mark Turner was a young boy, his father and two brothers would pile into a Chevy pickup and head for the Oregon woods. While his dad cut down trees to support the family, the boys ran through pine-needle-padded hills, scrambled up rocks, dipped their toes into cool creeks and constructed forts from nature’s bounty. “We’d play in those woods for hours,” recalled Turner, a member of St. Matthew Parish in Hillsboro. The strongly built 56-year-old is among a declining number of Oregon loggers. He knows the industry that once shaped the region’s economy and development has an uncertain future, but he also wouldn’t want to do anything else — although he’s tried. Graduating with a degree in engineering technology from Oregon Institute of Technology, Turner took a job with an aircraft manufacturer in Southern California, focusing on fighter jets and B-2 bombers. It was exciting work, but he wasn’t at peace. He felt pulled back to the forests and the hard work of logging. Turner’s father started a logging company in Banks, Oregon, in 1959, after serving in the Korean War and trying his hand at farming. There was ample work and loggers earned better-than-average wages. But it’s hard, dangerous work. Logging has one of the highest rates of workplace fatalities, according to 2016 Bureau of Labor Statistics data. The risks are personal for Turner, whose older brother was killed in a logging accident the summer after finishing his freshman year in college. “My mom, understandably, really didn’t want me in the woods,” Turner said. And she had her wish until Turner left his California job and returned to Oregon. Turner, who took over the family business with his brother when their father died in the mid-1990s, loves the physical challenge and the camaraderie with other loggers. “It’s hard to explain, but it’s the being outside, being in nature and that two days on the job never look alike,” he said. By the 1990s, however, there had been dramatic changes since Turner Logging was founded. Wages had stagnated and profit margins were lower. Reasons cited for the drastic drop in the portion of lumber coming from the West include the recession in the 1980s, increased competition, over-harvesting, technological advances and environmental litigation. Turner — current president of the American Loggers Council, an advocacy coalition of state and regional logging associations and councils — said he believes his work, done right, can help the forests thrive. Turner Logging works primarily for timber companies, but sometimes sawmills. Most jobs are thinning trails by removing selected trees, some already dead. The company also harvests trees for utility poles. During the summer, Turner’s day begins at 3:30 a.m., when he tackles office work before the sunrise around 5 a.m. He’ll then go from site to site checking on jobs in progress or scouting out a site before making a bid for a job. Turner has done everything his crews do and will jump in and run machinery if a worker calls in sick or doesn’t show up. He’ll fix broken equipment himself when he can. On a recent afternoon, a logging job took him to the top of Wildcat Mountain, about 40 miles outside Portland. He could see majestic Mount Hood, Mount St. Helens and Mount Jefferson. “Standing here gives me a lot better sense of creation, just being in tune with God and the beauty of nature,” he said. Turner’s teenage son and his brother’s children have no interest in logging, and Turner is OK with that. The work is too hard, too dangerous and too underappreciated to insist his son follow in his footsteps, he said.